Draco walked around the city looking for friends to help him. Venom jumped from wall to wall with great speed and strength, his tongue hanging out of his mouth as he searched for someone to kill. He walked calmly knowing what all was here in New York. Venom sensed someone, looking around he spotted a person, well not exactly a human. He chuckled, leaping at them with incredible strength in an attempt to pin them to the ground. He smirked and jumped up quickly. Venom landed onto the ground with a shaking thud as he opened his mouth wide, hissing as he leapt at him again. Venom snarled, catching his food with amazing reflexes, snapping his large sharp teeth at him. 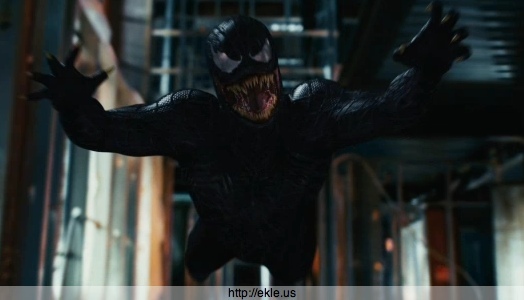 Venom put up his other arm, blocking the kick before lunging his jaws at him. Venom jumps back snarling at the fire. He snarled again, moving further back. Venom snarled one more time before running into a deadend. He jumped up onto the wall and leaped up behind jumping back down towards Draco, vines of symbiotes extending from his skin. Venom still came, for tentacles shooting from his body at his opponent as he got closer. Venom swatted at the fireballs with his tentacles as they came at him, lessening the damage, but he was blown back. He extended his hand shooting web at him. Venom pulled back one more time, before lunging at him, tackling at Draco. Venom's once again pulled back before going for a bite to Draco's neck. I grabbed his throat "not this time"